As it is known to all, Cisco is a top worldwide leader in telecommunication industry. Its products and services are excellent, which includes application networking services, optical networking, routers, switches, interfaces and modules, etc. This article will not introduce all Cisco products, only focus on Cisco SFP modules for Gigabit Ethernet. Firstly, we should have a brief review about the term “Gigabit Ethernet”. In computer networking, Gigabit Ethernet, or marked as GbE or 1 GigE, is used to describe various technologies for transmitting Ethernet frames at a rate of a gigabit per second. It is defined by the IEEE 802.3-2008 standard. The standards for Gigabit Ethernet are as below. After reviewing the Gigabit Ethernet standards, let us move on to Cisco SFP Modules for Gigabit Ethernet. According to Gigabit Ethernet standards, Cisco SFP modules for Gigabit Ethernet have many types, such as 1000BASE-T SFP, 1000BASE-SX SFP, 1000BASE-LX/LH, 1000BASE-EX, 1000BASE-ZX SFP etc. Below text will introduce the three most common types: Cisco 1000BASE-T SFP, Cisco 1000BASE-SX SFP and Cisco 1000BASE-LX/LH SFP. The Cisco GLC-T is compliant with the Gigabit Ethernet and 1000BASE-T standards as specified in IEEE STD 802.3 and 802.3ab. Cisco GLC-T operates on standard Category 5 unshielded twisted-pair copper cabling of link lengths up to 100 m (328 ft). It supports RJ-45 connector. Moreover, Cisco GLC-T has low power dissipation (1.05 W typical). The operating temperature range of Cisco GLC-T is 0 to 70°C. The GLC-SX-MMD, compatible with the IEEE 802.3z 1000BASE-SX standard, operates on legacy 50 μm multi-mode fiber links up to 550 m and on 62.5 μm fiber distributed data interface (FDDI)-grade multi-mode fibers up to 220 m. It can support up to 1km over laser-optimized 50 μm multi-mode fiber cable. And GLC-SX-MMD could be connected with dual LC/PC connector. The average output power is -9.5~ -3dBm and receiver sensitivity is -17dBm. Its operating temperature range is -5 to 85°C. The GLC-LH-SMD, compatible with the IEEE 802.3z 1000BASE-LX standard, operates on standard single-mode fiber-optic link spans of up to 10km and up to 550m on any multi-mode fibers. It is joint with dual LC/PC connector. And the transmit and receive wavelength ranges from 1270nm to 1355nm. The average output power of GLC-LH-SMD is -9.5~ -3dBm, too. However, the receiver sensitivity is -21dBm. As stated above, Cisco GLC-T, GLC-SX-MMD and GLC-LH-SMD can be applied under Gigabit Ethernet and have their own features. If you are looking for all or one of them, Fiberstore is an excellent choice. 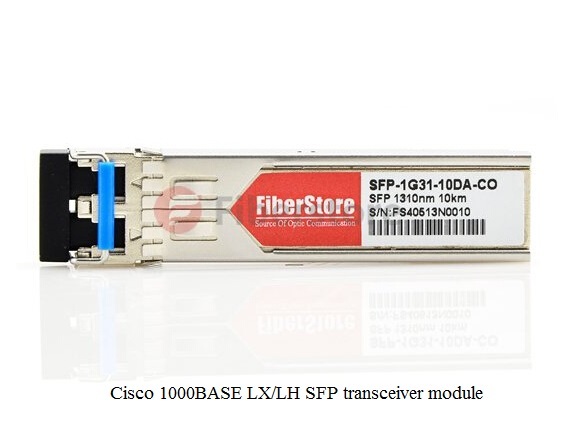 Fiberstore provides fine Cisco GLC-T, GLC-SX-MMD, GLC-LH-SMD and many other SFP modules at very reasonable price.